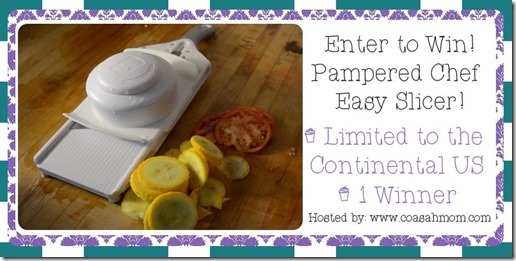 To help you prepare your veggies for freezing we have an amazing Pampered Chef Consultant that is offering COASAHMOM.COM readers the chance to win their own slicer from her store! Be sure to head over and checkout the great benefits that are available at the moment. The round stone with handles! I’m a huge Pampered Chef fan, so, it’s hard to pick just one. I the Roc Crok! Love the grill pan dinner set. The chef slicer is my favorite product. I like the slice n serve! I love the Rokcrok! Looks really handy! I could use a new apple wedger. I like the new Stoneware Round Stone with Handle. The old pizza stone with rack I have is kind of a pain to store because the rack takes up so much space. I really like the Small Bamboo Knife Block Set.